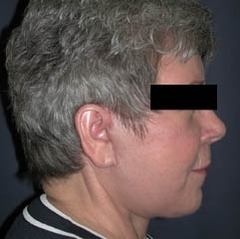 This sixty-two-year-old semi-retired real estate agent was bothered by the loose skin and abundant fat in the neck area. 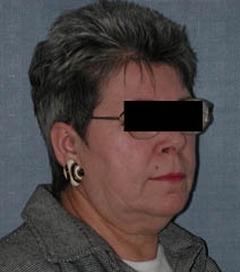 She was also displeased with the look of her eyes and forehead. She had undergone mastectomy for breast cancer in 1991 and was a breast cancer survivor. She had previous skin cancer on the upper lip. 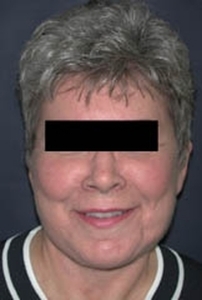 I recommended that she undergo an endoscopic browlift to rejuvenate the area around her eyes, as well as a facelift to address the cheek and neck areas. 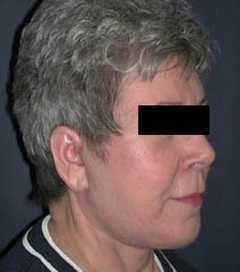 She underwent an endoscopic browlift, along with a facelift and tightening of the muscles under the neck. The tissues in the neck and cheek were repositioned in a more desirable location. The procedure was done with an overnight stay. Ten days after the procedure, all the sutures had been removed and most of the bruising resolved. She continued to recover uneventfully. 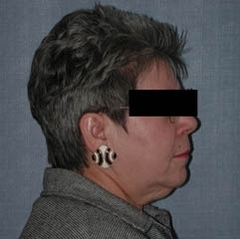 Her photographs six weeks after the procedure show an amazing improvement in her neck contour.